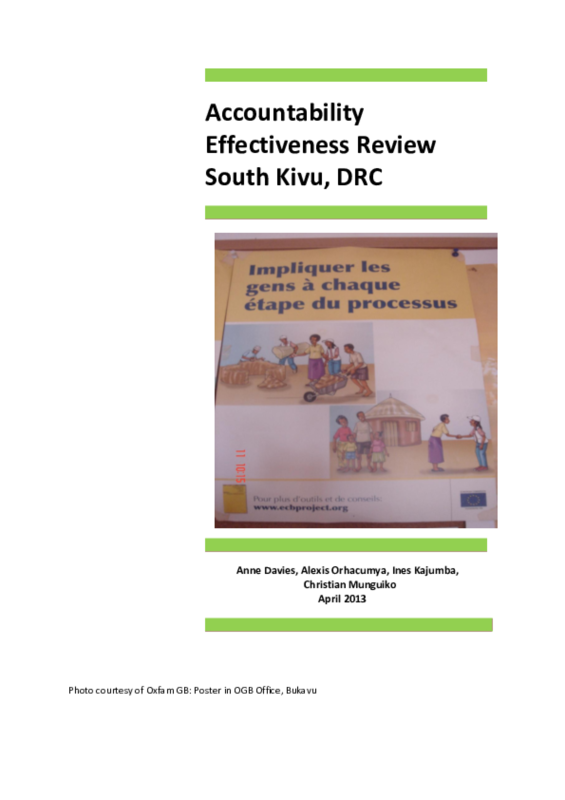 This study reviews a number of projects in eastern Democratic Republic of the Congo (DRC) and assesses the extent to which Oxfam is meeting its Minimum Standards on accountability commitments to partners and to communities. By conducting an analysis of how accountability standards and tools are currently being used it is possible to gain a snapshot of 'accountability in action' to serve as a baseline upon which improvements can be made. The study was conducted in South Kivu in DRC in April 2013. Data was gathered through on-site focus group discussions with beneficiary communities and structured interviews with Oxfam staff, partners and other stakeholders. Results from the study aim to assist Oxfam's learning process of improving accountability to beneficiaries and partners.